The new Autodesk Inventor Tolerance Analysis toolset was designed to help Inventor users make informed decisions while specifying manufacturing tolerances. This CAD-embedded, 1D tolerance analysis software will help you understand the impact of mechanical fit and performance based on cumulative dimensional variation. View this webcast to see the Inventor Tolerance Analysis toolset and how you can begin leveraging it today. See the latest enhancements to IMAGINiT Pulse, including additional integrations with multiple business systems and software platforms, as well as support for the Autodesk Vault 2019 product release. During this webcast, we explored IMAGINiT’s eLearning and support solution, ProductivityNOW, and how it can help your organization better evaluate potential new hires and existing staff, provide support for employees to improve efficiency and productivity, and attract and retain good talent. 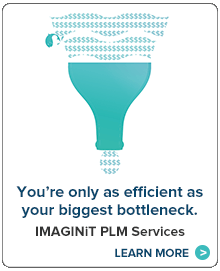 During this webcast, IMAGINiT expert Caleb Funk explored the different manufacturing tools available in Only One AutoCAD and how they can help you work smarter and faster with the AutoCAD Interface that you are already familiar with. During this webcast, IMAGINiT expert Brady Scoffield explored the new tools now available in Autodesk Fusion 360 and how you can begin leveraging them today. During this webcast, IMAGINiT expert Ed Gillman explored the unique simulation capabilities that Nastran In-CAD brings to the Autodesk Product Design & Manufacturing Collection and how you can take advantage of this valuable simulation tool today. During the webcast, IMAGINiT expert Stan Wile explored the Leica BLK360 and showed how you can easily integrate this technology with Autodesk Inventor to reference point clouds in your designs. During this webcast, IMAGINiT expert Caleb Funk explored Inventor and AutoCAD Electrical and how you can use the tools together to connect electrical design data associatively to a 3D electrical control box. In this 40-minute session, Caleb Funk shows different techniques in Inventor for simplification and how to simplify large assets for Inventor Factory. In this 35-minute on-demand session, Sean Tolodziecki dives into proven data sharing options available in today’s fast paced technology climate. These techniques will arm you with the information needed to drive highly effectively data exchange strategies within your organizations.